papersnack: who reads that magazine? While doing the demographic research on Gourmet Magazine for yesterday's post, I became curious about who reads all the other big food titles. So I clicked around and came up with a quick breakdown of magazine demographics. I am always amazed (and thrilled) at the information one can find online. I was going to include Cook's Illustrated as well, but because they have zero advertising in the magazine, they've no reason to post this kind of data on their website. I went to the bookstore the other day to check out The Gawker Guide to Conquering All Media . I searched in vain in new-non-fiction and media. Is it in self-help? Finally, I asked a salesperson. No, they did not have it, but if they did - it would be in humor. I thought that was funny. In the current issue of the New Yorker, culinary scribe Bill Buford uncaps his pen on Gordon Ramsay and throws down twelve pages titled, "The Taming of the Chef: Can Gordon Ramsay Make it Here?" Buford was afforded all-area access to the pugilistic chef from the pre-opening of his eponymous NYC restaurant last November to post-reviews in March. Buford paints the portrait in his usual style, current events interspersed with the historic bio, many details of which come via Ramsay's autobiography Roasting in Hell's Kitchen. The article notes that Ramsay arrived last fall with a film crew in tow, recording his quest for another three Michelin stars. I'd hazard a guess to say this article was sold on a similar pretext. Suffice it to say the film is not going to be made, but Buford has documented a story very rarely seen - the stuggle and denouement of a high-profile restaurant and its chef. We've all read the reviews, but now we've a candid recount of the chaos (staff problems, theft, miscalculations, etc.) behind the scenes. Seemingly everything that could go wrong did. When strategizing the big media coverage, of course the interest is putting forth the best, most shining portrait. It was likely unforeseeable and unimaginable that this is the story that would be recorded. An interesting point is Ramsay's confession of masterminding the notorious incident in 1997, when the reservation book for his restaurant Aubergine was stolen by a man on a motorcycle. The story made the rounds of the British papers, with Ramsey pointing the finger at mentor and rival chef Marco Pierre White. Ramsay now confesses to orchestrating the incident to create distraction and give himself the edge during a difficult period of negotiations with his partners. The reservation book in fact resides in a safe in Ramsay's home. I'm sure Marco Pierre White will respond with some very colorful remarks and gestures. To wit, Marco's autobiography hits stores in May. Ramsay and White have a shared history, though each recounts their own version. Knowing the British media's penchant for a good dust-up, I'm sure it's only a matter of time before we start to see the articles that deconstruct the stories into a battle of the memories. Welcome to the gastrodome. Two chefs enter, one chef leaves. PS: At the tail end of the article, Buford writes..."Alain Ducasse is the last foreigner with a reputation to open a restaurant in New York." And Robuchon? Seems he's doing just fine. "If that's how you pay back your friend, and people who've helped you, that's sad...But I've always said ambition is one of the most dangerous preoccupations in the world." It's worth noting that the 2007 Michelin Guide for France came out yesterday. It should be in stores on February 28th. As with all guide books, the news is about who won (Anne-Sophie Pic, new a new three star, notable because she's a woman) and who lost (Taillevent and Le Cinq demoted to two stars). The official press release from Michelin and a pretty good round up of all the action on Bloomberg. Most people have friends in their own profession, because you meet people at work or industry events and the like. It's not surprising that many of mes amis are writers and journalists in the food arena. To wit, here's a last-minute gift idea, special holiday shill for my friends. Kitchen Sense is a very comprehensive book on how to cook everything, written in a very conversational and often witty tone by Mitchell Davis. I had the pleasure of attending many of Mitchell's impromptu dinner parties while he was testing the recipes, and I can attest to both due diligence and deliciousness. Mr. Snack is particularly fond of the New England clam chowder recipe, declaring chez Davis his favorite neighborhood restaurant. My waffle recipe is on page 111. While it seems au courant for pastry chefs to go savory, Michel Richard is the original. He converted from sweet to salty with a suigeneris flair decades ago. Peter Kaminsky wrote his cookbook Happy in the Kitchen and, again, a dinner party of recipe testing yielded an engaging and satisfying soiree. It's a beautiful book, the kind with heavy paper and lustrous photography that you rarely see anymore. Peter's been quite prolific this year and has a second book with Fabio Trabocchi, the young soignée Italian chef at Maestro in Tyson's Corner. Fabio's restaurant in the Ritz Carlton is all gastro-elegance, but his book Cucina of Le Marche is a familial voyage home. I'm desperate to make his cream fritters, but fear the fried creaminess will skew the serving size from six to a giant portion for one. PS: If you need to make room on your bookshelf for the New Year – drop off your remainders at the James Beard House for their February cookbook and tag sale. My recent blog negligence has been due to a hectic dead-lines and travel schedule. Whist waiting in airports to fly, I've been reading Hipster Haiku by Siobhan Adcock (Broadway Books $9.95). Have enjoyed it immensely and wondered, should I start sna-iku? Here's two for the road...news breaking tomorrow. 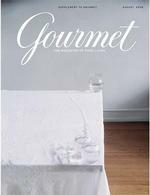 Says "I have no life"
If my musings on Gourmet’s August supplement left you hungry for more…well now there is more. No it’s not a download of the pages, I already asked and that was nixed by the legal department. It’s podcasts with Ruth Reichl and the authors, online now and forever at Epicurious. Shrink-wrapped with my August issue of Gourmet was a mini-zine supplement. There’s been a bit of posting and press on this already, but I’d like to add my two cents. It’s a collection of writing from more than a dozen authors, a series of photos and an illustrated story. They’re loosely bound by the subject of food, in some cases the gastronomic factor is almost incidental to the actual theme. Not all the stories were 100% satisfying, but many were quite rich. I made note of many things. Watch out for the new novel by Nicole Mones. Find a Sailor Moon DVD. Dirty dishes can be attractive. Chef turned gastro-adventuring author Tony Bourdain has circled the globe a few times in search of the most exotic and extreme edibles for your viewing pleasure. 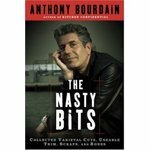 His latest book, The Nasty Bits (Bloomsbury $24.95), is a compilation of previously published articles. I read it. I liked it. I wrote about it. Nice when a civilian reviewer says something like “Bourdain portrays his subjects with an authenticity that rings true,” as they often do. But how does Big Time Book Reviewer know ‘authentic’ from sitting in a cubicle at The Major Publication? I’ve been to many of the spots detailed and know many of the chefs described and yes – it’s exactly like that. But you don’t have to be in insider to enjoy, and any chef will tell you - the nasty bits (collected varietal cuts, usable trim, scraps, and bones) are often the tastiest part. 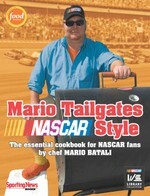 By now everyone knows what you eat at the races. But do you know what to drink?